It is a wonderfully relaxing holistic treatment. It involves massage and then a pressure technique using the thumbs and fingers on the reflex areas found in the feet and hands. 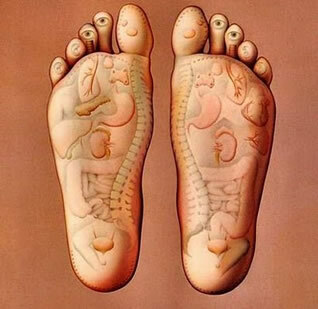 Reflexology is extremely effective and is based on the principle that reflexes in the feet and hands correspond to each organ and structure in the body. They are like ‘mini maps’ of the body and are linked to those organs by energy channels, zones or meridians. When illness occurs in the body, the corresponding energy channels become blocked, and Reflexology is applied to help to the body to remove these blockages, allowing the energy to flow freely again, so restoring the body's natural balance and therefore good health. It dates back to Ancient Egypt, India and China, this therapy was not introduced to the West until an ear, nose and throat surgeon called Dr William Fitzgerald developed 'Zone therapy'. He believed that reflex areas on the feet and hands were linked to other areas and organs of the body within the same zone and uses acupuncture needles on areas of the feet to achieve anaesthesia on other areas of the body he was doing surgery on. In the 1930's, Eunice Ingham further developed this zone theory into what is known as reflexology. Her opinion was that congestion or tension in any part of the foot is mirrored in the corresponding part of the body and by treating the feet these could be relieved. It has been practiced in the UK since the 1960’s and has become more and more popular and established as a complementary therapy. On your first session a complementary consultation is given to explain reflexology to you and to ask you medical and lifestyle questions to help to plan the best treatment for you. Any information will be kept confidential. For the treatment you would either sit back or lie on a couch with your socks and shoes off only. The treatment involves massage and pressure application to the feet. You may feel areas of transient discomfort during treatment and sometimes sensations in other areas in the body, but generally the experience should be very relaxing. The treatment usually takes 30-60 minutes to do. How often you have treatment done is up to you, although it is sometimes worth doing a course of treatment if treating a particular condition/s. It is useful to give feedback to the reflexologist either during or after the treatment as this may show the response of your body to treatment. This in turn might help the reflexologist to tailor a treatment plan specific to your needs. After one or two treatments your body may respond in a very noticeable way. Most people note a sense of well-being and relaxation; however, sometimes people report feeling lethargic, nauseous or emotional which is transitory and reflexologists believe that this can be part of the healing process as the body starts to heal itself. Book a relaxing reflexology session today to sooth those tire foot.